Samaresh Majumder is a famous Indian Bengali novelist. The author spent his childhood in the tea garden of Doars in North Bengal. He specifically mentioned North Bengal in many of his writings. He also success script writer of TV serial. He won BFJA, Dishari and Film Promotions Association award as a script writer. Arjun is a famous fictional detective character which is created by him. He did not just write stories or novels, he has special skills in short stories, travel stories, teenage novels. 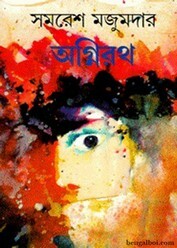 Notable novels are- 'Satkahan', 'Tero Parbon', 'Swapner Bazar', 'Ujan Ganga', 'Souar', 'Takapoysa', 'Jolchhabi Singho', 'Abas', 'Amake Chai' etc. Now I want to share with all dear blog readers, an another remarkable book- 'Agnirath by Samaresh Majumder' as pdf file.